Make some room please, clear some space, and meet the new sarpanch. Bhamburwadi village in Pune has just elected a new head, who could be the oldest sarpanch in the country. 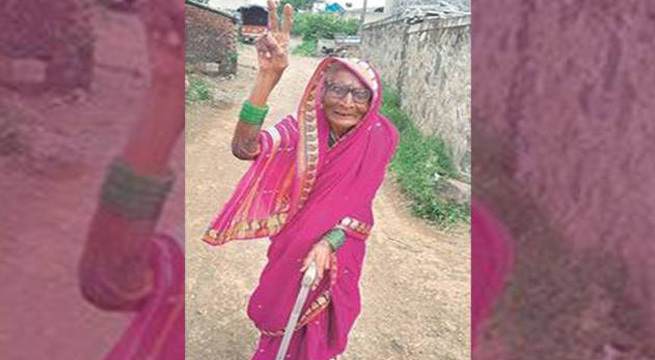 Meet 94-year-old Gangubai Nivrutti Bhambure. Despite being in her nineties, Gangubai is fierce, active, has a strong physique and great eyesight. She wakes up at 5 am, does household chores, and then goes out in the village to see what is going on, every day. She has four sons and a daughter, but lost her husband ten years ago. How does she manage to stay so spirited? “Eat less and live longer – that’s my secret of life,” she tells Indian Express. According to the Indian Express report, Gangubai’s prime concern is getting water to farmers with parched lands — she plans to use a nearby canal by constructing a pipeline. Other things on her priority list include, developing a proper drainage system, building good roads, and ensuring that there are enough toilets. “I will not disappoint them… I can walk like a youngster and talk like a teacher. Nothing affects me, rain or sun,” says Gangubai. “Now it’s time to work. I have to do something for my people, otherwise it’s no use becoming a sarpanch just for the sake of it.” Gangubai told the newspaper that she would like PM Modi to visit the village. She plans to write a letter to the prime minister about the pipeline needed for adequate irrigation. “PM Modi is like my son. My oldest son is 66 years old and I am told the PM is around the same age… I am sure he will pay heed to the voices of farmers,” she says. Traditionally, panchayats are male dominated systems. Currently, the law requires panchayats to have 33 percent women representatives. And though it could be raised to 50 percent in a few years, many villages don’t always meet even current standards.